My first stab at map-making: I can't deny that this is a novelty map, but my priority is gameplay. A few minutes' study will reveal some interesting choices. 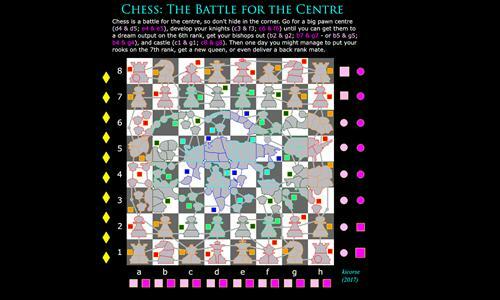 The central bonuses are good value whereas the edge bonuses are poor value, so there is a need to fight for the centre. However, the large super-bonuses make it necessary to cover the edges. Also, the central bonuses have strategic disadvantages such as double-borders. Recommended 2v2 template: https://www.warzone.com/MultiPlayer?TemplateID=1138241. The low value of the corners might make the map interesting for FFA players. A = armies-per-turn; T = number of territories. Chess piece icons made by http://www.freepik.com from https://www.flaticon.com. Flaticon is licensed by Creative Commons BY 3.0 (http://creativecommons.org/licenses/by/3.0/).